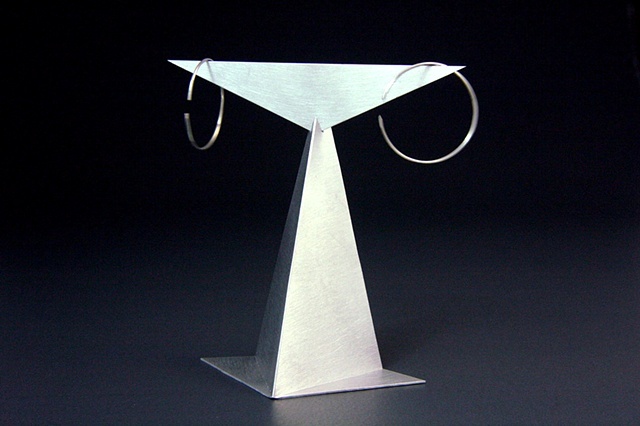 This all Aluminum earring stand is the next step in the evolution of our jewelry display series. It is tall enough to hold most drop earrings, the base provides stability without a bulky appearance and it is lightweight. The height is 9.5cm (3 ¾”), the width on the top is 10cm (4”), the base width is 7.5cm (3”) and it measures 4cm (1 9/16”) from front to back. We put holes in it for post style earrings and we can customize it. The stand is copyrighted and signed by Jewels Curnow.